The western section of the Chobe National Park has been provided with life by the winding waterways of the Savute Channel for many generations. This game rich area of Botswana provides travellers with superb game viewing opportunities in an unspoilt environment. It is on the banks of the dry Savuti channel that Savute Safari Lodge peers out from amongst the beauty of gnarled acacia camel thorn trees. This channel has a bizarre history of drying up during good rains and having flood levels at other times. The beauty of this area, created by the silhouettes of the many dead trees which relied on sustenance from the water supply of past years, combined with the congregations of old bull Elephants, diversity of animals and abundance of predators makes Savute Safari Lodge a highlight destination for any safari traveller to Botswana. Geographically, Savuti is a place of mystery and great unkowns. The fascination which adds to this true African wilderness area – The Savuti Marsh, is a remnant of a vast inland lake, cut off from its traditional supply of water many years ago by the same movement of the earth`s tectonic plates that brought the Okavango Delta into existence. It is part of the Mababe Depression and is fed by the temperamental Savuti Channel, which has not seen flowing water since it dried up in 1982. 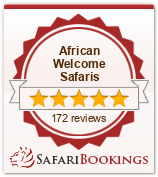 The main activities are organised game drives in open 4 x 4 safari vehicles throughout the Savute area. A visit to the Savute Marsh will give you a chance to see the Savute Channel at the marsh against a backdrop of teeming wildlife. A visit to the ancient San rock paintings at Gubatsa Hills can also be included. Savute is famous for hosting the second largest summer Zebra migration in Africa, the timing of which is governed by the rains, which usually occur between November and December and again between February and April. During this time the Zebras move from the north in search of the ripe, lush grasslands and full waterholes situated in the Southwest of the park. Zebra migration is always followed by a large number of hungry predators in search of their meal of the day.